The following dog house plans are free. They include a wide variety of dog house designs, shapes and styles. Some are insulated. Also see our free plans for dog ramps. Selection of manufactured dog houses . Georgia-Pacific provides a set of plans and detailed instructions for this dog house. Another Lowes dog house project, with full set of plans and instructions. If you have a large dog, then this dog house is for you. A lot of during construction pictures makes this an easy build for most home handymen. An ornate dog house made from plywood sheets. Detailed plans and instructions are easy to follow. This dog house is built as an A-frame and is easily re-sized to suit any dog breed. A somewhat unique, insulated dog house. Requires minimal tools and woodworking skills. 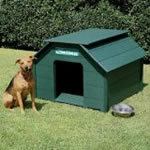 Lowes provides a set of plans and instructions to build a dog house that is a home. Constructed from cedar, this dog house requires a medium level of woodworking skill.